What Vegetables Can I Eat With Diverticulitis? Diverticula are small pouches that can form along the esophagus, stomach and in the small and large intestines. These small pouches can become infected and inflamed, causing the condition diverticulitis, reports MayoClinic.com. Signs and symptoms include abdominal pain, fever, bowel changes and nausea. Diverticulitis is generally treated with rest, antibiotics and diet changes. For people with diverticulitis it is important to know what to eat when an attack occurs and what to eat to prevent another attack. When a person is experiencing a diverticulitis attack, liquids and a low fiber diet is recommend to allow the diverticula to decrease in inflammation and heal. A vegetable broth or vegetable stock can provide nutrition and prevent dehydration during an attack. According to All Recipes, a basic vegetable stock includes olive oil, water, onion, celery, carrots, garlic, parsley, thyme, bay leaves and salt. Heat the olive oil in a large stock pot and cut up the vegetables and place in the pot for five to ten minutes. Add the salt and water and bring to a boil and then let simmer for thirty minutes. Vegetable stock can be frozen in individual servings and used as needed. Once an attack has subsided and the person begins to feel better, they can begin incorporating foods with fiber back into their diet. It is important to start out with low fiber foods so not to irritate the diverticula. 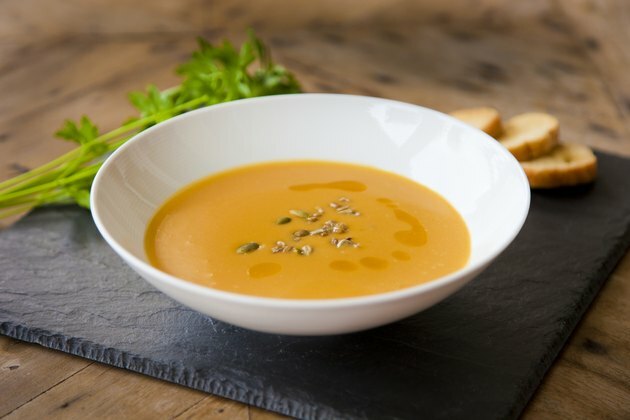 According to the MayoClinic.com, well cooked vegetables with the skin and seeds removed are easily digested after an attack. Canned vegetables generally have lower fiber amounts than its fresh counterparts. Squash, tomatoes, onions and asparagus all contain low fiber amounts. The National Digestive Diseases Information Clearinghouse recommends that people consume a high fiber diet to help prevent a diverticulosis attack. Broccoli, cauliflower, potatoes, lettuce and spinach all contain high sources of fiber. The MayoClinic.com, recommends that people consume 20 to 35g of fiber a day. Fiber helps stools and allow it to pass through the colon easily. Add fiber gradually to avoid discomfort and bloating. For those who have a hard time consuming the recommend amount of fiber, supplements such as psyllium or methylcellulose can be purchased over the counter to add fiber to the diet. Can You Eat Peanut Butter With Diverticulitis?